Understanding floating floors – Rules to know by heart! A floating floor is a floor that is not anchored to the subfloor – nor anchored underneath kitchen cabinets. It is a floor that requires expansion and contraction. It requires expansion gaps be ADHERED TO without fail – or your floor will surely fail! iCork Floor highly recommends that any/every traditional cork floor receives 2 coats of appropriate polyurethane at the time of installation. Forna cork floors require use of the Loba finishes. Please contact your Forna representative for more information. Failure to follow these guidelines will void your warranty. a. 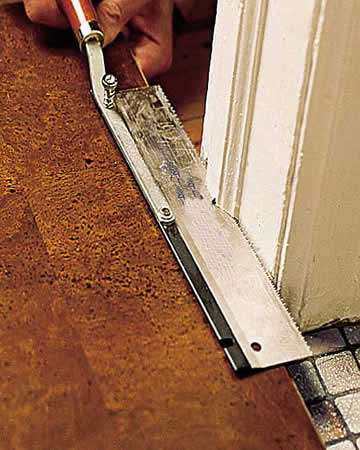 Expansion gap MUST BE INCORPORATED to reduce continuous floor lengths of LESS THAN 25 LINEAR FEET! c. Expansion gaps, OR TRANSITIONS, must be used through doorways. Cork floating floors MUST BE the last thing to be installed in a kitchen! Apply 2 coats of water based polyurethane once the floor has been installed! Look for any vertical trim that will need to be cut away to allow the new flooring to slide beneath it. At doorways, place a cork plank atop the saddle (the threshold) and butted to the door stops. Using a flush-cutting backsaw, trim the stops?abut not the jambs?a]on either side of the door above the saddle. Carefully pry up the saddle before installing the flooring. Also cut the casings on the wall around the door, using a cork plank to judge how much to trim them. In a kitchen installation, remove the cabinet toekicks if possible so you can run the cork under the cabinets. If the kick is stationary, plan to install the flooring up to within ? inch of the toekick. This gap can be hidden in the finish step. Installation over concrete, such as in a basement, requires the removal of any baseboard so you can cover the slab with 6-mil polyethylene sheeting and run it 3 inches up the wall. Overlap the sheeting’s seams by 8 inches and seal them with tape. remove the waste piece of wood. Then, pry up the saddle before installing the cork flooring. Also, use the backsaw to trim the casings on the wall around the door. 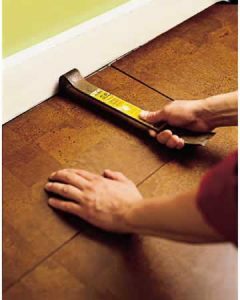 Again, use a cork plank as a guide to judge how much of the casings you need to trim away. Start laying the planks along the longest uninterrupted wall. Measure the distance between it and the opposite wall, then subtract 1 inch for expansion. 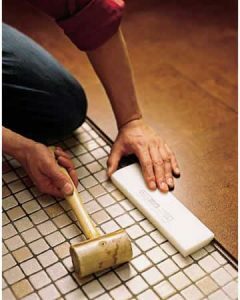 Divide the remainder by the width of a cork plank to calculate the number of courses needed to cover the floor. If the last course ends up being less than half a plank, you’ll need to cut the first and last courses narrower to balance the layout. Add the width of the last course to the full width of a plank. Divide by two to find the width of the first and last course. 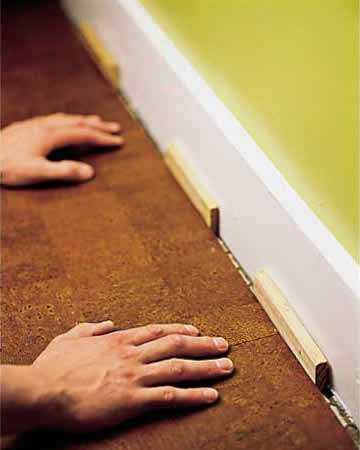 Use a jigsaw to rip the first-course planks to this width. If you don’t need to rip down the first course, saw off their tongues to create an unobstructed expansion gap at the wall. its end into the end of another plank and gently press down until the tongue and the groove click together. Continue joining planks end to end until the first course is complete. 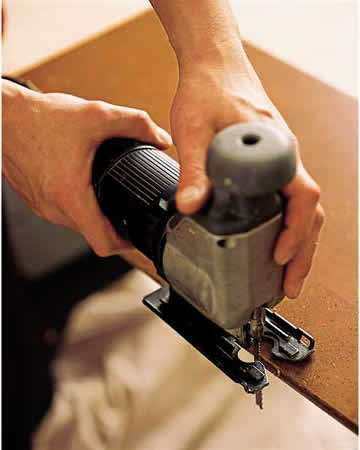 If you need to cut the last piece to length, use a jigsaw guided by a clamped straightedge. groove side facing toward you, tight against the spacers. If you cut the last plank of cork flooring in the first course, and the leftover piece is longer than 10 inches, use it as the first piece in the second course. Set the cut end of the plank against a spacer at the end wall, then push the tongue of the plank against the first course. Place a tapping block against the plank, fitting it around the groove. Use a hammer or mallet to tap block and coax the tongue and groove to click together. Install the next plank by clicking its end into the previous plank, then tapping it against the previous course. Continue install cork floor planks until you have filled the field. Tip: To keep the floating floor from moving as you tap in the following courses, weight it down with the stacks of uninstalled planks. If necessary to fit the final course, rip down the cork flooring planks to width, taking away from the groove side. Remember to account for the 1/2-inch expansion gap. Angle each piece into place and let it drop flat to the floor. To click and lock it to the previous row, hook it with a pry bar and pull the bar toward you. Tip: Rent a table saw for cleaner, quicker cuts, especially if you’re flooring over a large area or more than one room. 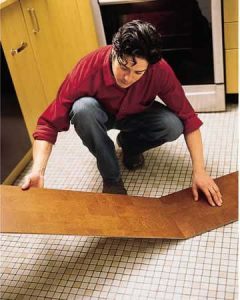 Install cork flooring should be the final step after any other decoration work. Be sure the sub floor is completely dry, clean, flat, and sound before starting. Vacuum or sweep the floor thoroughly to get it free from dirt or any other substance.